Roy E. Finkenbine is a Professor of History at the University of Detroit Mercy and the Director of the Black Abolitionist Archive. When I’ve used that line over the years in speaking to audiences about the loosely-organized network that aided runaway slaves in the pre-Civil War U.S., it has usually elicited surprise. Since slavery ended, most Americans have come to view the Underground Railroad as an extremely well-organized and thoroughly-routinized system. In part, this image can be traced to the railroad metaphor that came to describe the network in the 1840s. Railroads, after all, run on tracks and on time. In part, it is due to the work of pioneering Underground Railroad historian Wilbur H. Siebert of Ohio State University, who’s Underground Railroad from Slavery to Freedom (1898) still shapes our understanding of the network today. 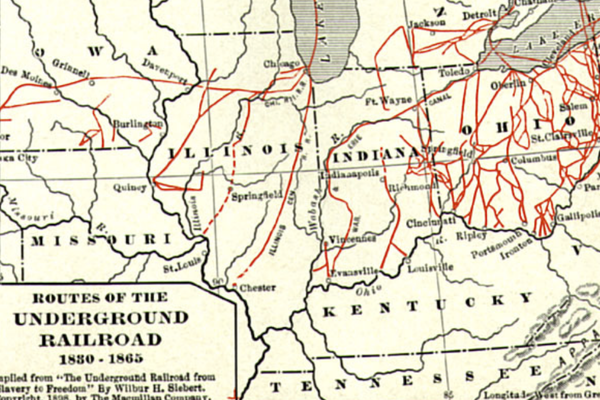 In the volume, he called the Underground Railroad a “great system,” “a series of interlocking lines,” and “a chain of stations leading from the Southern states to Canada.” Of greater significance, perhaps, was a map in the volume, which showed the Underground Railroad as a series of distinct lines and approximated a railroad map. That illustration has been widely reproduced in textbooks, in publications and museum exhibits on the Underground Railroad, and on the Internet. Several months ago, an enlightening example of the improvisational nature of the Underground Railroad arrived in a letter from my cousin Darlene Cassidy. She had been going through the personal papers of her late father and my uncle Marvin Stanley and found documentation of the Underground Railroad work of her great, great grandparents Obadiah and Sarah Williams of Pickrelltown in Logan County, and later Hardin County, Ohio. Some additional research on my part helped to establish other elements of their personal story. In 1893, when Williams was “an elderly man,” he shared reminiscences of his activism with the daughter of another Underground Railroad activist, who passed this information along to Siebert. It resides today in the Siebert Collection at the Ohio Historical Connection. Obadiah and Sarah, lifelong members of the Society of Friends, were motivated to perform this work as a divine calling. As a young man, Obadiah transported a wagonloadof grain from Pickrelltown to the Cincinnati market. There he encountered runaway slaves and heard their story for the first time. It made an indelible impression. Not long after returning home, he befriended a fugitive named Meschach “Mose” Moxley and eventually traveled to Kentucky to buy the freedom of his wife and children. The Moxleys settled in nearby Bellefontaine, where Meschach became a prominent gunsmith. These were merely the first of many northbound African Americans aided by Obadiah at Pickrelltown. Obadiah’s first experience as a “conductor” on the Underground Railroad took place in the summer of 1841 or 1842. After hitching up the horses, he and a fellow activist carried a fugitive through Marysville to the home of activist John Cratty in Delaware, in a nighttime ride of more than thirty-five miles. Cratty’s home was considered a “halfway point” on the way to Quaker safe houses in Mount Gilead in Morrow County. This would become Obadiah’s usual route for transporting escaping slaves. On this occasion, however, they took a slight detour, “fearing to go through Middleburg,” a nearby village. After resting, they returned home the next day. On another trip, they delivered a runaway some twenty miles to Marysville and left him at the home of a Presbyterian acquaintance, returning home the same night. Circumstances varied. In October 1844, in a particularly illustrative case of improvisation, Obadiah conveyed a runaway slave couple and their three or four children from Pickrelltown to Mount Gilead, a distance of more than sixty miles. One local furnished the team, another a covered wagon with flaps that closed in both front and rear. Obadiah eschewed night travel and the usual route, observing that “the road through Marysville was now so well watched by Slave-hunters, it was not safe to go that way.” Instead, he concocted a plan to accompany two friends who were taking a load of produce northward to Marion. Obadiah followed them, posing as a farmer hauling grain to one of the ports on Lake Erie, thus avoiding suspicion. At Marion, he turned eastward toward Mount Gilead, completing the journey in three full days and successfully delivering his human cargo to Quaker activists there. His wagon empty, he returned home by the usual route. After Obadiah and Sarah married in 1845, they moved northward to Hardin County, where they continued their Underground Railroad work, with Sarah assuming a frequent and often major role. According to family oral tradition shared by Evangeline Bealer, a local historian and another great, great granddaughter of the couple, Sarah, too, was a master of improvisation. On one occasion, a family of fugitives had spent the night at their Hardin County farm. As their guests were finishing breakfast, two slave catchers approached the house. Obadiah went outside to meet them under the guise of helping them water and rest their horses. Meanwhile, Sarah cleared all evidence of breakfast from the table and hid their guests elsewhere in the house. She then invited the slave catchers into the house and fed them a hearty meal. As they talked, she listened carefully to their conversation, including their travel plans. Once they left to pursue their human prey, she hitched up the horses to a wagon and took the runaways to safety by way of an alternate route. When the slave catchers returned from their unsuccessful mission, she bedded them down in the room where the slaves had slept the night before. The work of Obadiah and Sarah Williams demonstrates the improvisational nature of the Underground Railroad in a very personal way. But they are merely two among hundreds of activists whose stories make this important point. Greater attention to the way in which they and others assisted fugitive slaves entrusted to their care will revise and correct the public perception of the network as an extremely well organized and highly-routinized system.